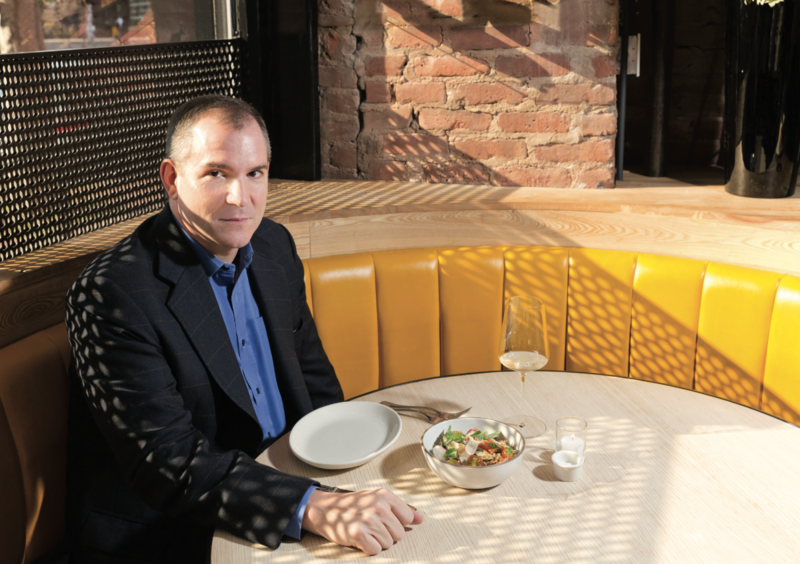 It’s been half a decade since Frank Bruni held the revered—and occasionally reviled—post of restaurant critic for The New York Times. In his current op-ed columnist role at the paper of record, where he’s now spent nearly 20 years in an eclectic collage of gigs, he’s more likely to sound off about tenure than tagliatelle or tartare. The din of feedback is equally fervent—not that Bruni has ever read the comments. We tucked into a bowl of farro salad with him at Charlie Bird to discuss. What’s new since your review days? That phase of my career was sort of an odd digression. When I was named food critic in 2004, I’d already been at the Times for nine years, doing broad-based political stuff. My little brother has always joked that I don’t have a career—I have an attention deficit disorder. Were you surprised to nab that gig? I was certainly aware of this mythology of The New York Times‘ restaurant critic, but I never fantasized about having the role. How did being a generalist of sorts make you a great food critic? I don’t know if I did a great job! I’m the worst judge of that. It’s really hard to analyze your own work. I brought less reverence for chefs and restaurant traditions. My reviews were a bit more varied and unconventional in approach, because I didn’t marinate in that world beforehand. I loved food, had dined around a lot, and lived in a foreign country, but I wasn’t the most erudite about food. As compensation, I had eclectic real-world knowledge. Restaurants are about a lot more than food—they’re about culture, theater, anthropology, and sociology. Has the role shifted more in the past five years? Two decades ago, there weren’t nearly as many people making a point of trying restaurants and considering themselves “foodies.” Last spring, I taught a food-writing seminar at Princeton. The 16 students in the class went into New York to try certain restaurants, knew what was going on in the New York dining scene, and were familiar with the big chefs around the country. You couldn’t have found 16 kids like that 20 years prior. Ten years prior, even. There must’ve been quite the waiting list. There were 48 students who applied. I deliberately didn’t choose the 16 students who seemed like the most geeky foodies. Still, 12 of the 16 students had pretty good restaurant-scene vocabularies. Do you remember your first-ever review? I was a nervous wreck! I’d just moved back from Rome, and I didn’t have occupancy of the apartment I’d bought yet, so I wrote it in this horrible temporary apartment the Times put me in. It had terrible feng shui. I stopped every three paragraphs and questioned myself. But I remember that that review wasn’t edited much. Are there any takedowns you regret? The only one that keeps coming back to me is my review of Barbuto. It was a few years old when I wrote about it, and I gave one star. I wrote, “As you ranged around the menu, the food could be sort of uneven.” I adore Barbuto—it’s one of the five restaurants I eat at in this city. I don’t know if it was a completely inaccurate review, but I only eat a quarter of the menu, and that quarter is, for me, a three-star restaurant. As a critic you’re obliged to reflect all of a restaurant’s ambitions and its menu in a review, but that’s not the way people use restaurants. Did you deal with lots of scathing criticism? The first year or two that I was the critic, there was a website called The Bruni Digest that was an ongoing parody of my reviews. I only read it once because I know how tape-loop obsessive I can be. I’m not one of those writers with a Google Alert on my name. I don’t read comments on my columns. I don’t want to see them. I get onanistically addicted to the positive stuff, and get masochistically obsessive about the negative stuff. I don’t have enough energy as a human being to spend the mental bandwidth on what people are saying and then do my job. It’s self-defeating. Did you ever feel like a celeb of sorts? I certainly didn’t! I’m guessing most critics don’t feel like celebrities. You’re trying to avoid having people know what you look like, and you don’t want to be too much a part of the story. During those five years, I never posed for a photo or appeared on TV. The only thing that kind of broke my anonymity was when Nora Ephron, my very good friend, was making Julie & Julia and cleverly decided to stud the movie with bit parts for food-world people. I got it cleared with my bosses. I asked not to have my name in the credits. After all the editing, you basically see me dopily chatting at a table and applauding Amy Adams’ duck. Have you considered returning to the food beat at any point? After I left the critic role, I didn’t entirely stop writing about food. I wrote a number of travel pieces; I did a very long piece a year or so ago for Condé Nast Traveler about the rising restaurant scene in Bogota, for example. I don’t write about food full time and I don’t want to again, but I still have the freedom to dip in. I think I always will dip in; it’s something I love. What do you miss most about being a critic? Having all of my meals expensed! I still eat out a lot for work, so I expense some meals. Maybe I’ll pick up the tab when I eat with a political strategist, but I certainly can’t take these people to Le Bernardin. I ate three or four times at Masa and six times at Per Se as the critic; it did not cost me a dime. Which restos are in frequent rotation? I’m here at Charlie Bird at least once a month; I’m probably in Barbuto every three weeks; same goes for Szechuan Gourmet. I go to Hill Country and Perla a lot, too. I like Gabe Stulman—he knows how to put together a fun restaurant, and he and his staff know how to make customers have a great time. Do you have more chef friends these days? Absolutely! When I was a critic, I had none—I couldn’t. But I got a sense with some people, like The Spotted Pig’s Ken Friedman, that we might get along. They were like friends in waiting. Pop Secret’s sea salt flavor of microwave popcorn. Extremely salty, but surprisingly good. I buy fantastic salmon and cook it for really short time at a very high temperature. It’s astonishing how foolproof it is. Everyone thinks they need to poach it. Just coat it with something—I use Dijon mustard and blast it with dill. And don’t overcook it! I also make very good meat loaves—veal meat loaf, turkey meat loaf. I even thought about making a meat loaf book with my friend. Speaking of books, you’ve got two new tomes on the docket, right? One is called Where You Go Is Not Who You’ll Be, and it’s coming out in March. It originated from a column I wrote during college admissions season, when kids freak out about where they’ll get in. The book is an argument against investing too much anxiety and importance, in certain demographics, in getting into one of the two dozen most competitive schools. The other book I’m working on is about the fraught relationship historically between fathers and sons. It looks at the last five presidents and how much they’ve been stamped by their relationships with their fathers, or lack thereof. Among prominent men in America, you can notice kind of fraught father-son relationships, and that isn’t an accident. Do you have any pals in fashion? When I worked for Detroit Free Press, Robin Givhan was one of my best friends. We’ve totally fallen out of touch, but not for any reason. We were very close—we both lived in this former paint factory turned into luxury loft apartments you could have for a song because it was Detroit. We lived on the same floor, and we were both L.A. Law addicts. We’d watch it together every Thursday, switching apartments each week, padding down the hall shoeless.